Help to increase your advertising potential this Summer by having your personal details printed upon our excellent new Company Footballs from Calendar Lady Promotions. So help to promote your business with our Company Footballs today and stay advertised. To find out more about our Company Footballs click here and fill in the contact form and we'll get straight back to you. 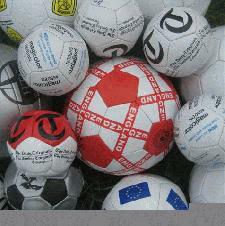 Other promotional and personalised items besides our Company Footballs click here.